Resource Book by Carol J. Miller. A Resource Book is recommended for each participant. View the Leader Kit here which has the elements for the leader to facilitate this course. Customize this flyer to use as a bulletin insert, newsletter ad, or post around the area. 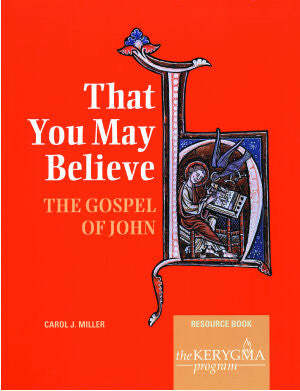 In fourteen clear, directed sessions, walk anew through this Gospel to the end "that you may believe." John's Gospel offers spiritually attuned, stunningly beautiful insights into the nature of Jesus and the meaning of faith. We witness signs and wonders, view contrasts of darkness and light, blindness and sight, death and new life as John puts before us who Jesus is, where he has come from and where he is going. From start to finish John's purpose is plain: "These things are written that you may believe that Jesus is the Christ, and believing ... have life in his name."